2 Almond Avenue. 99-year leasehold. Completed 1998. 123 units. Terraces: 257 - 303 sq. m (built up area); 150 - 284 sq. m (land area). Semi-Det: 267 sq. m (built up area); 351, 403 sq. m (land area). 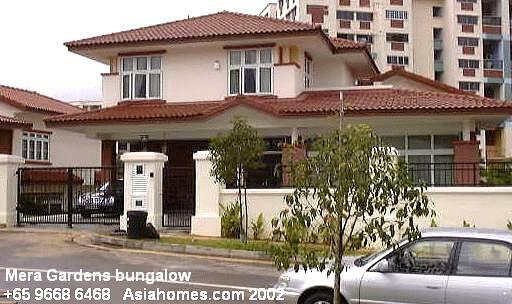 Bungalow: 414 - 589 sq. m (built up area); 550 - 1204 sq. m (land area). 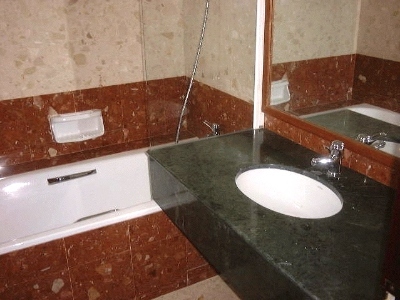 Finishes: Living/dining - marble tiles for terraces, granite tiles for semi-detached and bungalow. Bedrooms - timber strips. Built-in wardrobes, kitchen cabinet, cooker hob and hood and air conditioning system. Facilities: Playground and fitness track. 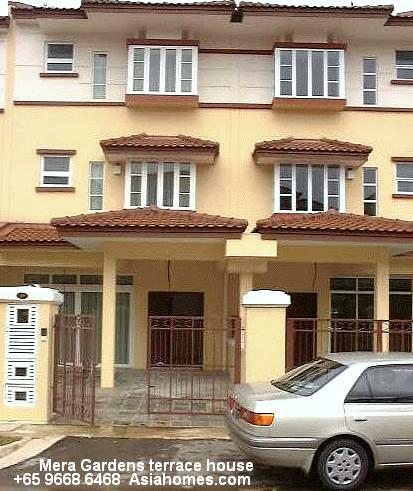 A pleasant neighbourhood of Landed Properties in the Petir Road area where there is a Housing and Development Board estate with all the amenities and convenience of retail shops. Located near a Light Rail Transit station which goes to the Choa Chu Kang subway. The Bukit Panjang shopping mall and library is nearby. A small playground. Houses are mainly owner occupied. Rentals are lower than those bungalows in Districts 9, 10 and 11 as the location is further from the international schools. A 10-min drive to the American School. Competitors: Houses in Cashew and Chestnut Gardens/Drive or popular Sunset areas. Investors to note: 99 years. 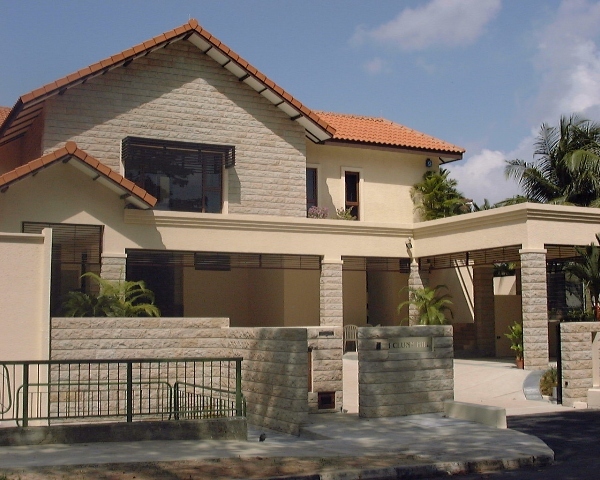 Houses are a cheaper alternative for American expatriates when compared to the ones next to the American School, renting at around $7,000 for intermediate terraces at Woodlands. Location away from the city and crowd. 5-minute drive to the Nature Reserve and mountain biking trails. 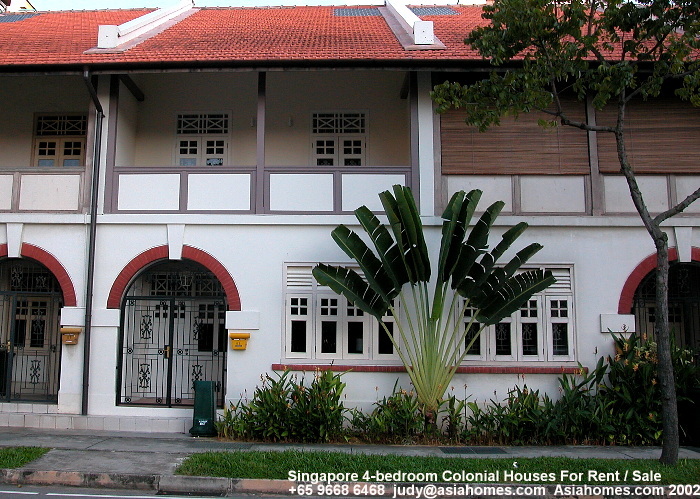 Lower terrace house rentals than the Woodgrove terrace houses near the American School. Around 10-minute drive to the American School. Not near subway but you have the light rail transit line nearby. This brings you to the Chu Chua Kang subway. Not an established Caucasian expatriate enclave. Check school bus services to the German/Dutch Schools. A small garden for the terrace houses. Bungalow facing playground. Backyard faces apartments Good quality kitchen cabinets. Microwave and oven. Marble clad master bathroom. High quality bathroom accessories. 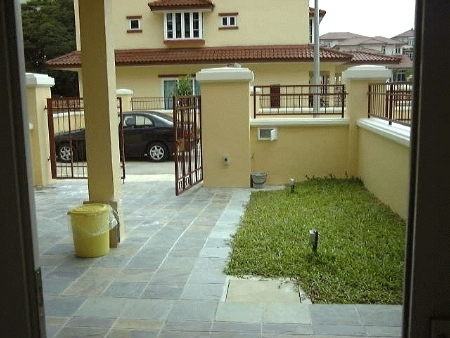 Tiled car porch with a small garden for terrace houses. 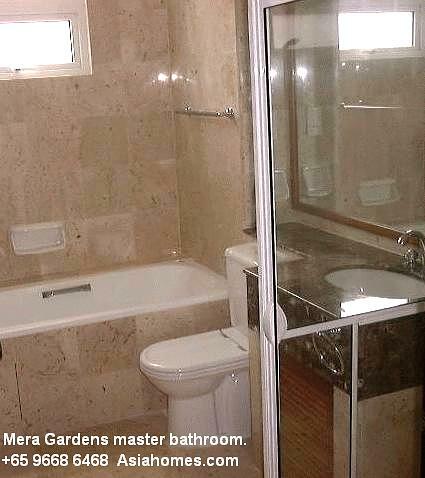 Master bathroom with shower stall and long bath tub. Marble flooring in the living and dining area. Parquet flooring in bedrooms. Very popular. Some units may be available. This true case is written to educate first-time realtors of Asia USA Realty. Case study: Conning the British auditor that he had a binding Letter of Intent. "I will ask the Realtor to sue me… The Letter of Intent was signed by me but another one with amendments was given to me to sign… I have not given the good faith deposit… The Realtor said I was bound to take up this 3+1 Costa Rhu apartment," said Mr Wayne. Mr Wayne wanted a waterfront Costa Rhu apartment at less than S$2,500 rental. In his hometown in Britain, there was no waterfront living. 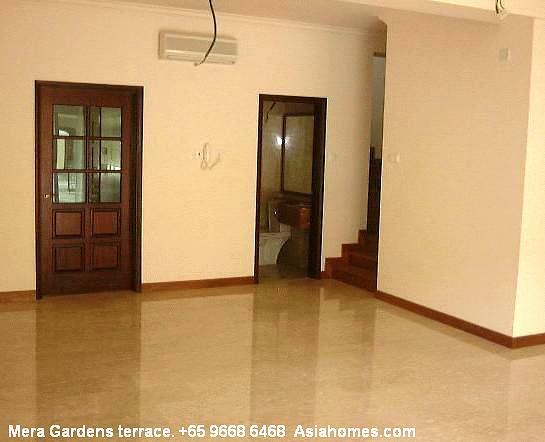 His colleague in the auditing firm was advertising that he had rented a fantastic 4-bedroom with waterfront view (Livonia Block, $3,300, 13th floor) from Asia USA Realty and he wanted a value for money waterfront unit too. The 3+1 unit on the 4th floor (Ancilla Block, $2,500 almost fully furnished, sourced from another realty firm) had a bit of sea view under the Benjamin Sheares bridge while the 2+1 on 13th floor (Charonia Block, $2,250 partially furnished from Asia USA Realty had a panoramic view of the Bay from the master bedroom although the living room faced the roof of the Oliva Block. Somehow, he had signed the Letter of Intent promptly for the 3+1 and now had 2nd thoughts but the Realtor insisted that he had a binding agreement. Being British and a gentleman, he wanted to reject the offer amicably but regardless of the Law of Contract, the Realtor refused to let go. An offer by the Landlord. ("Yes", in this case). An acceptance by the Tenant. ("Yes", in this case). A consideration. (Usually a good faith deposit or even $1. None in this case). An offer from the Landlord. (Yes, as an amended Letter of Intent was faxed to the Tenant). Acceptance by the Tenant. (No, he did not sign this new offer). Consideration (No, as he did not want the 3+1 unit). His girlfriend would appreciate his choice of this 2+1, high floor rather than a unit under the expressway bridge. $2,250 would be considered cheaper than what his colleague had rented, being $1,050 cheaper, on the same 13th floor but with 2 bedrooms less. Value for money. Certainly, his clients and colleagues would respect him for making a good choice as he advises on property investment portfolio and would look stupid if he had rented a more expensive condo. Such is the pressure on an auditor dealing with investment properties! As prospective Tenants have a wide choice of rental properties and a wider choice of realtors, it will be best to work professionally. That includes honesty as you may lose one case but get referrals from the expatriate who had declined your case. Professionals are not so easily duped and you will be better off spending your time getting a new prospect rather than hanging on. Do spend time farming for more Owners of quality rental properties if you can't retain or get Tenants. More tenants are being serviced by bigger firms or relocation companies in 2001 as multinationals downsize and outsource their expatriate relocation tasks. Outsourcing saves them money and more control. Some human resource departments of the big multinational companies do get presents or money for outsourcing. It is very unlikely that the small realtors will ever get the business of such companies. Focusing on owners and have an updated knowledge of the good properties with high rental value available may make a difference between survival and hunger. I foresee the internet wiping out many realtors by 2005 as the owners deal directly with the prospective tenants. It may be better to be an employee.